If any live server goes offline, an administrator has to be notified. Many companies use some third party services to do that. But what if you SQL Server service crashed for some reason? Will you be notified right away or will find out after many lost sales and transactions? What if SQLBackupAndFTP itself crashed (while extremely rare, but everything happens) – how would you know your backups are not being done? If you need to email to multiple recipients – as usually, just separate it by a comma. You need a paid plan with Full-Service subscription to use this option. « How to backup SQL Server to Yandex Disk	» What data SQLBackAndFTP sends to the server? Which license do you require to use this feature? I just turned this feature on, and I got this email: there is nothing wrong with the server. HDPDATA001 is offline as of 5/3/2018 8:31:06 PM UTC. SQLBackupAndFTP.com receives no communication from HDPDATA001. This means that the computer is either offline, restarting or SQLBackupAndFTP service running on this computer was stopped or uninstalled. 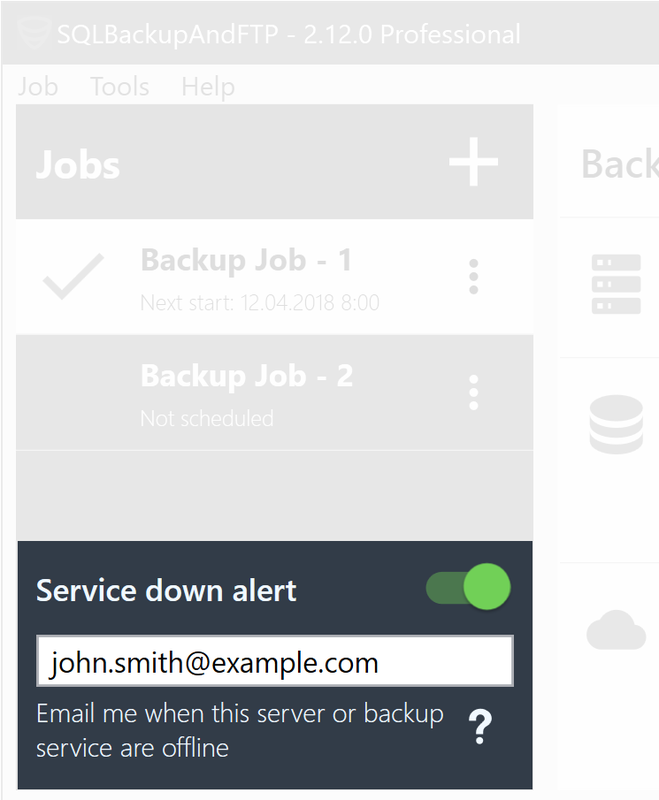 You are receiving this email because “SQL down alert” are ON for this computer and you are specified as a recipient of such emails.